This is an advanced skippering course for experienced yachtsmen who have a good knowledge of navigation and seamanship, and who want to undertake coastal passages by day and by night. You will plan and skipper a coastal passage and learn more about passage planning, pilotage by day and by night, boat handling, and safety and emergency situations. The course will be taken in tidal waters and your certificate will be endorsed accordingly. 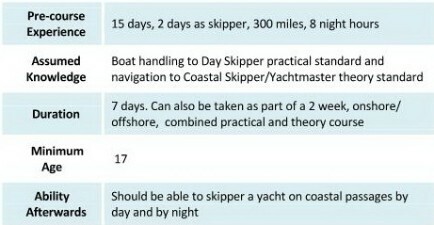 Please note that in order to obtain maximum benefit from this course you should have a good knowledge of navigation and seamanship, to the standard of the Coastal Skipper/Yachtmaster theory course. Ideally, the theory course should be completed beforehand. Alternatively, it can be taken along with this course as part of a two week, combined theory and practical Coastal Skipper course.